By the time he was 21, Rafael Yanez had already done what experts say the average American won’t do until he or she is 32. Yanez and his family—his wife, Leticia Lopez, and their children, Rafael Jr., 6, and Xitlali, 3—bought a home in the Back of the Yards neighborhood on the city’s South Side. They and their relatives, who purchased homes within blocks of each other, are part of a growing Latino presence in the housing market. In recent years, banks have paid more attention to the burgeoning Latino population because many—including large numbers of Mexican nationals—weren’t using the banking system. From 2000 to 2003, the number of home loan applications from Latinos in Chicago grew by 43 percent, from 9,455 to 13,564. Applications from all others grew 10 percent. Some banks are creating new products and rules that weren’t in place 10 years ago. Traditionally, for example, anyone applying for either a home loan or a bank account that paid interest had to have a social security number. In addition, banks normally assessed an applicant’s credit-worthiness by examining his or her history of making payments on utility bills, loans and credit cards. However, several banks have started to accept nontraditional forms of identification from immigrants. For home purchases, in lieu of a social security card, nearly two dozen banks across the nation are now accepting an Individual Taxpayer Identification Number, or ITIN, issued by the Internal Revenue Service to taxpayers who are not eligible for a social security number. As proof of identity, most people still need matricular cards, photo identification issued by their native countries. 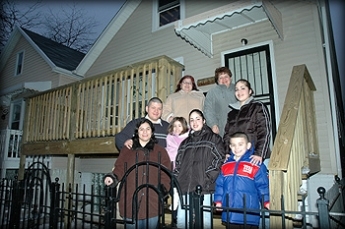 Some banks also consider rental history and remittances to family back home in Mexico as a basis for credit history since many immigrants don’t have traditional forms of credit, said Michael Frias, community affairs officer in the Chicago region for the Federal Deposit Insurance Corp., or FDIC. For some banks, it’s worth their time, and good for their pocketbooks, to change the rules a bit. Up to 70 percent of the growth for U.S. financial services between 2003 and 2008 could come from the Hispanic market, according to a 2003 projection by the TowerGroup, a research firm that studies the global financial services industry. That means an estimated $200 billion in new business, Frias said. As a child, Yanez saw how his father netted $50,000 after selling the family’s North Side home and returning to Mexico to buy a new one. When the family returned to Chicago a decade later, Yanez’ father used the proceeds from the sale of that home to buy in Pilsen. “I witnessed what he was doing and I took good notes,” said Yanez, who took free homebuyer education classes through Neighborhood Housing Services of Chicago, which provides lending and counseling services. He got a loan using traditional identification. But it’s estimated that 56 percent of Latinos nationwide do not use the banking system, prompting banks to try to figure out how to draw them in. One way is by bridging the gap of Latino homeownership. Nearly 70 percent of all Americans own their homes, Frias said. But it’s 47 percent for Latinos nationwide and 49 percent for African Americans. One San Diego, Ca.-based organization has put an estimate on the value of undocumented immigrants in the housing market. The National Association of Hispanic Real Estate Professionals in 2004 released a study concluding that roughly 172,000 undocumented renters qualify for $44 billion in real estate. “It’s an emerging market and it’s literally untapped,” Frias said. But not everyone takes the alternate forms of identification. Of the nation’s 9,000 banks, just 278 accept them, Frias said. Chicago, however, has proved to be ahead of the game. About 44 of the city’s 100 banks accept alternate forms of identification. According to an analysis by The Chicago Reporter, in 2000, applications from blacks outnumbered those from Latinos by about 2,600 in Chicago. Three years later, Latinos submitted 170 more applications than blacks and had more success. In 2003, 62 percent of all applications from Latinos resulted in home loans, compared with 48 percent of applications from African Americans. Some experts say the growth for black applicants is likely to be gradual in the coming years, mostly due to lack of lender interest. An example is the recently developed partnership between the Mexican consulate in Chicago and the FDIC. The two joined forces in May 2003 to form the New Alliance Task Force. The group, made up mostly of community banks and advocacy and community organizations, meet quarterly to discuss ways to improve financial literacy and banking for immigrants, create mortgage and bank products, and provide scholarship funds for the children of immigrants.